WASHINGTON, DC, January 15, 2013 (ENS) – The U.S. Fish and Wildlife Service has proposed to list the Gunnison sage-grouse as Endangered under the Endangered Species Act and designate 1.7 million acres of critical habitat in an effort to halt the long term population decline of the iconic western bird. Conservation organizations first petitioned to protect the species in 2000. Gunnison sage-grouse are among the most imperiled species in the United States. The National Audubon Society has identified the bird as one of the 10 most endangered in the country, and the Endangered Species Coalition declared Gunnison sage-grouse as one of the nation’s most imperiled species. Interior Secretary Ken Salazar’s status report, “The State of the Birds 2009,” found that western deserts and grasslands – inhabited by the Gunnison sage-grouse and other sensitive wildlife – are among the most degraded habitats in the country. The main threats to Gunnison sage-grouse are habitat loss, degradation, and fragmentation due to residential, urban, and commercial development and associated infrastructure such as roads and power lines. Some estimates suggest that over 90 percent of the bird’s historic habitat has been lost. On September 15, 2010, the Fish and Wildlife Service determined that listing the Gunnison sage-grouse as an endangered or threatened species was warranted but precluded by higher priority actions. The agency added the sage grouse to the candidate species list and assigned a high listing priority, saying that threats to the species were of high magnitude and immediacy. It also classified the Gunnison sage-grouse, Centrocercus minimus, as a full species. The Service then struck separate settlement agreements with WildEarth Guardians and the Center for Biological Diversity that scheduled either a proposed listing decision or “not warranted” determination for 2012 and a final decision by October 2013. As part of this agreement, the Service agreed to publish a proposed rule to list Gunnison sage-grouse and designate critical habitat. This proposal satisfies that requirement. The Gunnison sage-grouse is distinct from the Greater sage-grouse, identified by researchers as early as the 1970s and recognized as a new species by the American Ornithologists’ Union in 2000. While its historic range may have included parts of Colorado, Utah, New Mexico and Arizona, the species now occurs only in eight small populations in southwestern Colorado and southeastern Utah. Gunnison sage-grouse have experienced significant declines from historic numbers, and only about 4,000 breeding individuals remain. The human population in all counties within the range of Gunnison sage-grouse averaged a 70 percent increase since 1980. The projected human population for the year 2050 for the Gunnison River basin, the majority of the current range of Gunnison sage-grouse, is expected to be 2.3 times greater than the 2005 population. The population of Gunnison County, an area that supports more than 80 percent of all Gunnison sage-grouse, is predicted to more than double to approximately 31,100 residents by 2050. These population increases typically bring increases in power line installation which can cause a significant increase in grouse predation from golden eagles that use the power lines as perches to attack from, says the American Bird Conservancy. In one study, golden eagle predation on sage-grouse on communal breeding areas known as leks increased from 26 to 73 percent of the total predation after completion of a transmission line within 220 yards of an active sage-grouse lek in northeastern Utah. The lek was eventually abandoned. Livestock may compete directly with sage-grouse for rangeland resources. Grazing by livestock could reduce the suitability of breeding and brood-rearing habitat, negatively affecting sage-grouse populations. At least 87 percent of occupied Gunnison sage-grouse habitat on federal lands is currently grazed by domestic livestock. 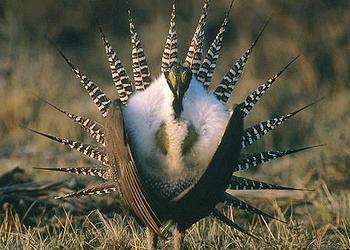 Livestock can trample sage-grouse nests and nesting habitat. Although the effect of trampling at a population level is unknown, outright nest destruction has been documented, and the presence of livestock can cause sage-grouse to abandon their nests.